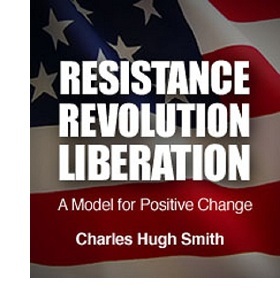 oftwominds-Charles Hugh Smith: Is 2012 a Reprise of 2008? Politicos declare the debt crisis is fixed and an imploding housing market is "contained," central banks flood the market with liquidity--hmm, does this remind anyone else of 2008? We all know that central banks and governments have been actively intervening in markets since the 2007 subprime mortgage meltdown destabilized the leveraged-debt-dependent global economy. We also know that unprecedented intervention is now the de facto institutionalized policy of central banks and governments. In some cases, the financial authorities have explicitly stated their intention to “stabilize markets” (translation: reinflate credit-driven speculative bubbles) by whatever means are necessary, while in others the interventions are performed by proxies so the policy remains implicit. All through the waning months of 2007 and the first two quarters of 2008, the market gyrated as the Federal Reserve and other central banks issued reassurances that the subprime mortgage meltdown was “contained” and posed no threat to the global economy. The equity market turned to its standard-issue reassurance: “Don’t fight the Fed,” a maxim that elevated the Federal Reserve’s power to goose markets to godlike status. But alas, the global financial meltdown of late 2008 showed that hubris should not be confused with godlike power. Despite the “impossibility” of the market disobeying the Fed’s commands (“Away with thee, oh tides, for we are the Federal Reserve!”) and the “sure-fire” cycle of stocks always rising in an election year, global markets imploded as the usual bag of central bank and Sovereign State tricks failed in spectacular fashion. Nothing was actually fixed, but we were encouraged to believe it had been fixed with a flurry of absurdly complex “reforms” that only increased the power of the central states and banks without actually addressing the underlying causes of the meltdown: extremes of leveraged debt, extreme concentrations of financial wealth that then bought political power, shadow banking and opaque markets for hundreds of trillions of dollars in notional derivatives, systemic fraud and embezzlement, phony valuations assigned to assets and liabilities, and various schemes to misprice risk, among others. If we had to distill the entire global crisis into the simplest possible statement, we might say that the collateral that supported this great inverted pyramid of leveraged debt vanished, and as a result the entire pyramid crumbled. Since the global housing bubble was at the heart of the crisis, let’s use housing to explain this simple summarization. If a house that was owned free and clear (no mortgage debt) rose in value from $200,000 to $500,000 during the bubble, the collateral of that asset was valued at $500,000 at the peak. If the house has fallen to $250,000 in the post-bubble decline, the collateral is now $250,000. The collateral was leveraged 33-to-1. This is delightfully advantageous if the house continues rising in value to $600,000, as that increase generates a six-fold return on the cash invested ($15,000 in, $90,000 out). But once the house prices slipped 10% to $450,000, then not only did the 3% cash collateral vanish, the collateral supporting the mortgage also declined. The mortgage was no longer “worth” $500,000. Since Wall Street securitized the mortgage into mortgage-backed securities (MBS) and sold these instruments to investors, then the value of those MBS also fell as the collateral was impaired. And since various derivatives were sold against the collateral of the MBS, then the value of those derivatives was also suspect. If $1 of collateral is supporting an inverted pyramid of $33 of leveraged debt, which is then the collateral supporting an even larger pyramid of derivatives, then when that $1 of collateral vanishes, the entire edifice has lost its base. And that's at the heart of current central bank policy: “Extend and pretend” is all about keeping the market value of various assets high enough that there appears to be some collateral present. In our example, the mortgage is still valued on the books at $450,000, but the actual collateral — the house — is only worth $250,000. The idea being pursued by central banks around the world is that if they pump enough free money and liquidity into the system, and buy up impaired debt (i.e. debt in which the collateral has vanished), then the illusion that there is still some actual collateral holding up the market can be maintained. The implosion of overleveraged subprime mortgages triggered the 2008 global meltdown because the market awoke to the fact that the collateral supporting all sorts of debt-based “assets” had vanished into thin air. Four years later, we have another similar moment of recognition: The collateral supporting mountains of sovereign debt in Europe has vanished. The value of the debt — in this case, sovereign bonds — is now suspect. The European Central Bank (ECB) has played the same hand as the Federal Reserve: Do more of what has failed spectacularly. Expand the money supply, pump in more liquidity and buy up the impaired debt all in the hope that the market will believe that there is still some collateral holding up the leveraged-debt pyramid. The ultimate collateral supporting the stock market is the book value of the assets owned by the company, but the notional collateral is corporate profits: equities are claims on the future free cash flow generated by the corporation. There are all sorts of inputs into this calculation, and markets are supposed to reflect these various inputs: currency valuations, sales, profit margins, costs of labor and raw materials, inflation and so on. Now that markets are manipulated to maintain the illusion that there is enough collateral out there somewhere to support the inverted pyramid of leveraged debt, it’s difficult to know what’s real and what’s illusion. One of the few ways we have to discern the difference is to compare various markets and look for divergences. If a spectrum of markets and indicators is pointing one way and another market is pointing the other way, we then have a basis for asking which one is reflecting illusion and which one is reflecting reality. In 2008, the central banks and governments lost control of the illusion that there was sufficient collateral to support a stupendous mountain of leveraged debt. By doing more of what failed spectacularly then, they have laboriously reconstructed the illusion that they control the markets (“Away, tides, for we are the ECB!”) and thus the valuation of collateral. Once again we are sternly warned not to “fight the Fed,” as if the Fed had the financial equivalent of the Death Star (“You don’t know the power of the Dark Side!”). Once again, we are in an election year where the four-year cycle is supposed to “guarantee” an up year in stocks. Or maybe 2012 is shaping up to reprise 2008, and the market will wake up to the fact that intervention doesn’t create collateral, it only creates the temporary illusion of collateral. In Part II: Why A Near-Term Market Rollover is Probable, we look at key technical indicators that suggest the Fed’s Death Star may not be the ultimate financial weapon in the Universe after all. There is a growing series of global data that suggest the run-up in the equity markets has reached its peak, and that the economic sickness the central banks had hoped to "cure" with all of their money printing is metastasizing. This article was first published on chrismartenson.com. Thank you, Christopher T. ($25), for your exceedingly generous contribution to this site--I am greatly honored by your support and readership. Thank you, Robert M. ($25), for your most-excellently generous contribution to this site--I am greatly honored by your support and readership.